Ready or not Christmas is right around the corner. In my house we love celebrating Christmas in July. We watch movies, make cookies, and drink hot chocolate and most of all I start planning for Christmas. I love making handmade gifts and if I don’t start early there is no way that can happen! Here is one of my favorite handmade gifts I have ever done and seriously the easiest as well!! Enjoy and happy crafting! I love, love, love giving handmade gifts. I have to say Pinterest has made my handmade gift giving soooo much easier. With just the touch of a button you have hundreds of ideas just ripe for the picking. Most people myself included are knee deep in Christmas presents right about now but I have two holiday birthdays to get through first. 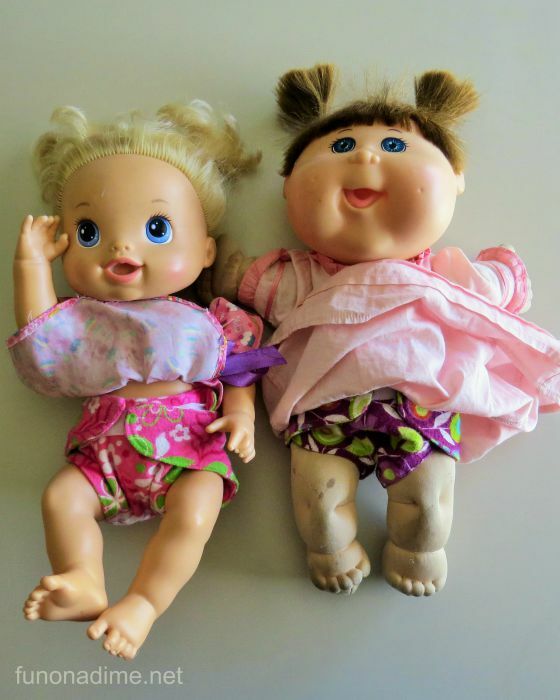 My 5th daughter will be turning 3 around Thanksgiving and she is all about dolls and babies. 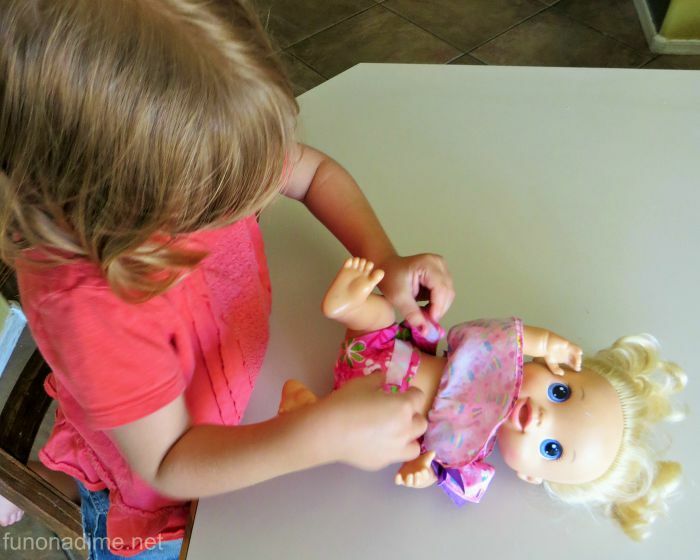 Her birthday/Christmas list includes everything you would ever need to take care of a doll! So when I came across a picture of handmade diapers I just couldn’t resist! 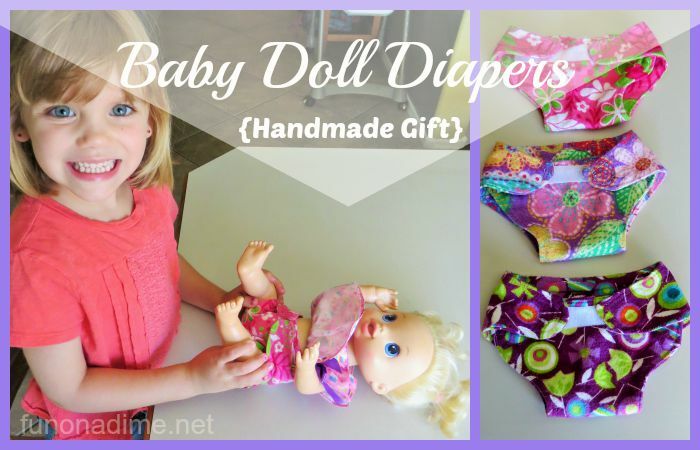 I used the pattern I found at Skip to My Lou for homemade baby doll diapers. I happened to have lots of scraps of flannel around so that is what I used to make my diapers. Free crafts are the most fun of all!! It turned out neat because they all ended up being different. The only thing I did to tweak the pattern was add a piece of Velcro all the way across the front to make it more versatile for all the different sized dolls and stuffed animals she has. They turned out so cute and so easy I made some for my 2 year old niece for Christmas and my 5 year old year old has requested some too! 😀 Give it a try and I am sure you won’t be disappointed. If you’re thinking there’s no way you have time or even want to make your own doll diapers, you can look at what Amazon has. Have you started making Christmas gifts yet?? Filed Under: Blog, Creative Gifts, Handmade, kids, Preschool, Sewing Tagged With: Blog, Christmas, Crafts, Made By Me! How adorable are these? Oh my goodness, when my niece gets older and is playing with dolls I will so have to look back on this to make! Oh my goodness. What a cute idea!! Very creative! How cute is that?! I love handmade gifts, I have many things that were hand-sewn for me as a child and I treasure them. 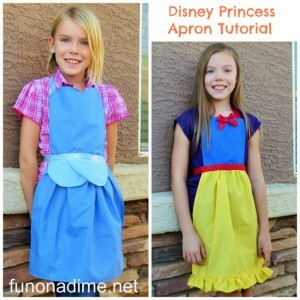 This is such a sweet homemade gift for little girls. Love this idea! That is adorable! What cute gifts these would make. These turned out SOOO cute, I bet your daughter is loving playing mommy with them, Michelle. I love these!! So cute and such a great gift idea! OMGosh those are ADORABLE!! I never thought to do this! i LOVE this idea! way better than disposable doll diapers !!! This is too cute! My girls would love those for all their dollies. What a great idea. 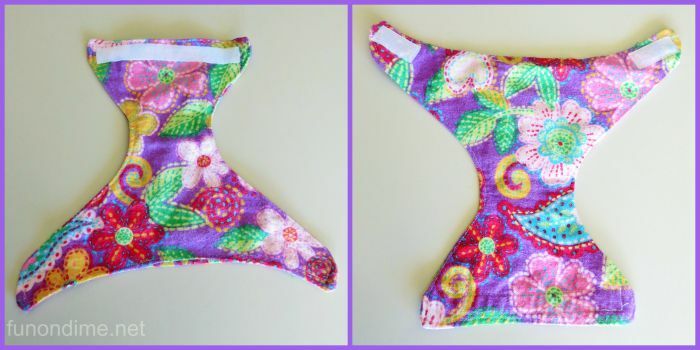 If you have one of those wetting dolls you can add a waterproof barrier and use a material that is absorbent to go in the middle part of the diaper. We are needing to do something like this for my 4yr old’s doll. Thank you for posting this information.